Edit: Red Moon Rising made it in to the second round of the TGT Tournament! The bad news is that I’m now facing up against the webcomic behemoth that is Sarah Ellerton. On the off-chance you like RMR better than the wonderful Phoenix Requiem, you should go vote for me. I’ve been doing a bunch of still life drawing recently, hence this cover. You guys should be seeing the fruits of all of that relatively soon, too. There’s going to be a big shake up of the comic in the next month or two! There’s a wee teaser posted up for the new vote incentive. Ooh, ahh, whatever could it be. Guess you’ll just have to go vote. 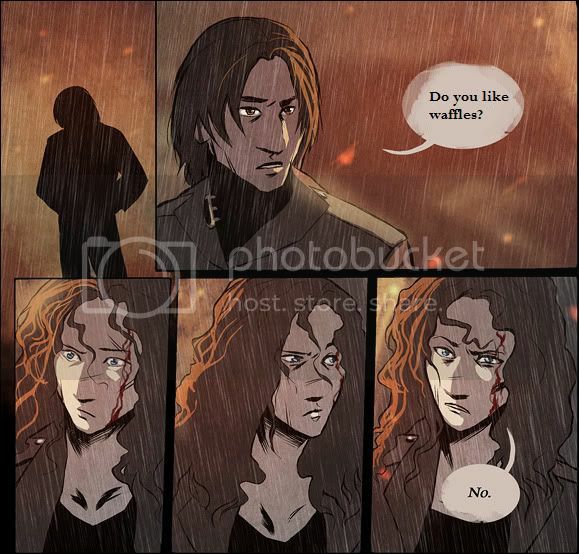 And on the formspring side of things, a lot of you seem to be pretty interested in my opinion on waffles. Patience Stewart saves the day once again, with this informative infographic that should clear the matter up nicely. This picture is awesome and I love it. You by association are also pretty great. (Been voting and lurking, but de-lurking now to say) WOWZA that life-drawing has paid off! This looks amazing! Thanks! It’s something I haven’t done for quite a while, but it’s really intriguing me at the moment. Whoa. Just- whoa. I mean, holy cow. That is the most amazing still-life I have ever seen. Ever. *drool* I am super excited for this chapter/month. On another tangent: Patience Stewart’s link. Shadow of the Reapers? I’ve read that before, I didn’t know she was a fan of this comic! Awesome. Thanks! Me too, though probably for different reasons. Updates may be a bit scattered while I am flying across the entire world. And that’s cool! Cross-fan-pollination or, or something like that. Don’t think I’ve commented here before but I LOVE that camera up there, lovely job on it! Thank you! It was a real pain to paint, haha. Oh no! RMR versus TPR?! CRAP! Those are my two favourite webcomics…. T.T Why?! [sigh] On a more calm side, this is the best chapter cover you’ve done to date. It’s amazing. I know, right? Even I had reservations about voting for me. Still, what can you do? TPR is pretty awesome. Yeah, that’d be my fault. Rose deserves it though. She’s OSSOM in real life, BTW. Yeah, I voted for her yesterday and today, as well. >8D Muahaha! I feel… diabolical.